Maintain your water clarity and keep your water clean with a Unicel replacement filter element. Unicel as well as the OEM filter company's use a spunbonded, 100 percent polyester material called Reemay as their filter medium. Reemay filter fabric is an FDA approved material for milk filtration and is a white material. Some low end manufacturers are using a yellowish material to reduce costs; this is also reducing quality and durability. 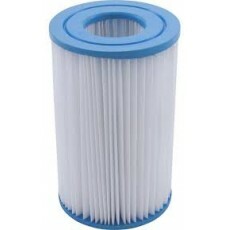 The Unicel replacement filter elements are designed to the performance standards of the original filter manufacturer. To maximize the life of your filter cartridges and to save on shipping it is recommended to purchase two filters and alternate two sets of cartridges when cleaning.